2learn® is a 501(c)(3) non-profit company. 2learn® was founded in 2012 and from its beginning has been fully dedicated to realizing its vision - to be the best place for the student to learn. 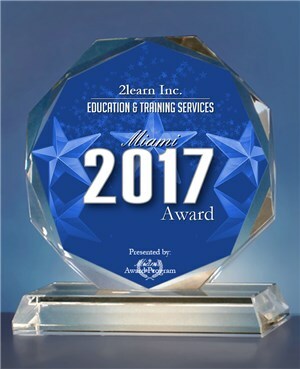 MIAMI June 1, 2017 -- 2learn Inc. has been selected for the 2017 Miami Award in the Education & Training Services category by the Miami Award Program. 2learn is a recipient of a Google Ad Grants award. The Google Ad Grants program supports registered nonprofit organizations that share Google's philosophy of community service to help the world in areas such as science and technology, education, global public health, the environment, youth advocacy, and the arts. Google Ad Grants is an in-kind advertising program that awards free online advertising to nonprofits via Google AdWords.